PARIC completed construction on a 43,000 sq. 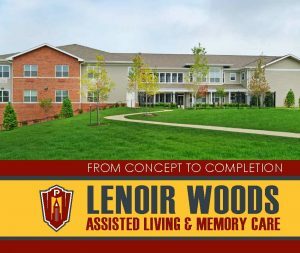 ft. building addition for Lenoir Woods Assisted Living and Memory Care in Columbia, MO in July of 2014. This addition, which will be converted to the Skilled Nursing Facility in the future, is two stories tall with a subterranean basement level beneath. The structure consists of structural light gauge metal walls and a floor truss system, structural steel and light gauge roof trusses. The building’s façade consists of brick, cast stone, hardie lap siding and trim, and aluminum windows. 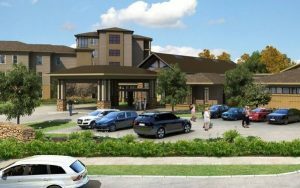 This facility allows for 20 assisted living beds and 20 memory care beds. During the course of this project, PARIC worked diligently to ensure that the existing operating facility and campus were affected as minimally as possible by construction traffic and related activities, which involved considerable logistics planning and coordination.